Is the Chuwi Hi9 Plus a good choice? 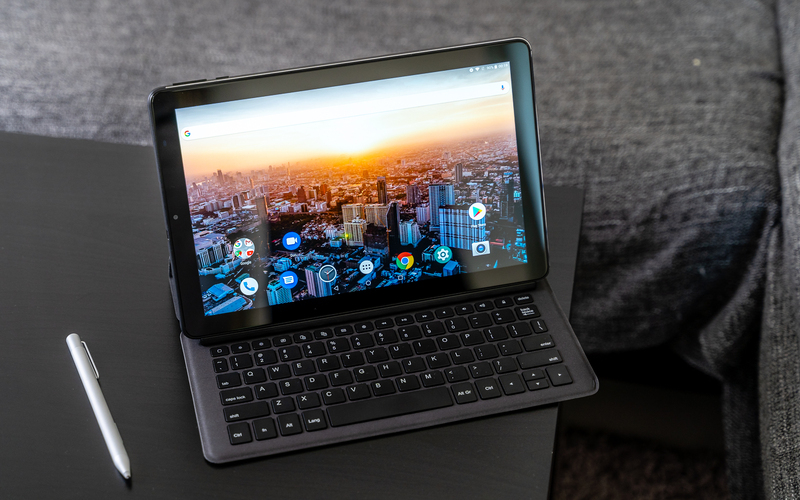 I reviewed this tablet and spend several weeks with it and its keyboard cover and stylus. Here is what you should know. The Chuwi Hi9 Plus is a 10.8-inch Android tablet from China that offers a lot of interesting features even though its price starts at just around 200 US Dollars. It has a high-resolution screen, an Helio X27 deca-core processor, integrated 4G LTE and almost pure Android 8.0 Oreo. Additionally, you can get it with an optional keyboard cover and an active stylus. Well, how good is this China tablet? I’m Andrzej for MyNextTablet.com and that’s what you’ll find out in my Chuwi Hi9 Plus review. Even though the Chuwi Hi9 Plus is very affordable, the build quality is pretty good. As with the smaller Chuwi Hi9 Pro (review), we do get an almost full metal body. There is a plastic cover for the antennas only. It is completely black, feels solid, is 8.1mm thin and weighs 500g. When holding it in portrait mode, we get a power button and the volume controls on the right side. There is a connector for the keyboard cover on the left side. And on the top, we get a USB C port, a headphone jack, and a card slot. In this one, you can put either two SIM cards or a SIM and a microSD card. Yes, LTE is built-in as a standard and you can even use it to send SMS or to make phone calls. Both cameras have a resolution of 8 megapixels. The front-facing camera is located on one of the shorter sides which is a bit unusual. Obviously, like pretty much always: Smartphone cameras take much better photos. But considering this is a China tablet, the quality is not too bad and good enough for snapshots or Skype. On the back, the Chuwi Hi9 Plus has two speakers built into the metal body. The sound quality is acceptable but certainly not good. It’s fine for watching some YouTube. But if you turn up the volume, the sound can be a bit scratchy. I love that you can get the Chuwi Hi9 Plus with an official keyboard cover because not many are offering that. The design of the keyboard cover resembles the one for the first iPad Pro generation. If you close the cover, the screen is protected but the back is not. The keyboard itself is pretty good. It consists of real keys that you can really press down. The keyboard is as big as keyboards from 10 to 11-inch notebooks are. I was able to type on it comfortably without having to get used to it that much. However, there is no touchpad. During my review, I encountered two weaknesses of the cover. An unfortunate but not too bad one is that the screen does not turn on or off automatically if you close or open the cover. However, a more severe problem is that the keys of the keyboard can press onto the screen if the cover is closed. That wouldn’t be an issue if the keys would be turned off when doing so. But that is not the case. I wondered at the beginning why the battery discharged so fast and why it got warm when carrying it in my backpack for a couple of hours. Well, that happened because the keys of the keyboard press unto the screen while being in my backpack. So, there is a keyboard input and the screen is turned on. I fixed the problem fast by disconnecting keyboard and tablet when putting it into my backpack. But still, that is not ideal. One reason for getting an official keyboard cover and not just a Bluetooth keyboard is so that the screen can be protected. But well, maybe Chuwi will fix this with an update. The Chuwi Hi9 Plus has a 10.8-inch screen with an aspect ratio of 16:10. It is an IPS display with a high resolution of 2560 x 1600 pixels. That means that the resolution is much higher than the ones from more famous brands in this price range. Texts and Pictures look very sharp and you can watch YouTube in 1440p. So, the high-resolution is great and I also like that the screen is fully laminated. Other aspects like viewing angles, contrast, and color reproduction are good too. It also is bright enough to use inside or outside in the shadows. However, it is a bit too dark to use comfortably in direct sunlight. You can navigate the touchscreen with your fingers and an optional pen that costs around 25 to 30 Dollars. That one is called Chuwi HiPen H3 and works with the Chuwi Hi13 as well. Even though the pen is inexpensive, it is mostly made of metal. You have to insert an AAAA battery in the back which is included. On the side, there is a button and the stylus supports 1024 levels of pressure sensitivity. I played with the pen a lot and it does work. But sadly, I did notice two negative things about it. For example, the stylus might support 1024 pressure points but the tablet certainly does not. I did not find any app that can distinguish between how hard I press. Another downside is that the stylus is not as precise as the Surface Pen, S Pen, or Apple Pencil. You can use it just fine to replace a mouse or to draw a bit for fun. But you can not do precise drawings. And even handwriting is not as precise as it is with the competition. Sure, these other pens usually cost over 100 US Dollars. So… I guess it is to be expected that this much cheaper one is not that great. As I said, it does work. But I really can not recommend it for professional designers or photographers. And I wouldn’t use it to take down notes at school or so either. The Chuwi Hi9 Plus houses a MediaTek Helio X27 deca-core processor that consists of ten cores. Two of those clock at up to 2.6GHz. Additionally, we get 4GB of RAM and a 64GB internal storage. Out of those only 8GB are used by the system. The tablet supports WiFi, GPS, Bluetooth, and 4G LTE. I reviewed the Teclast T20 with the same Helio X27 chipset already. And indeed, the benchmark results of both tablets in Geekbench 4 and AnTuTu are very similar. If you look at these alone, the Chuwi Hi9 Plus could almost be seen as a high-end tablet performance wise. However, those are benchmarks. In reality, the performance is more similar to the Samsung Galaxy Tab A 10.5 or Lenovo Tab P10 which are middle-class tablets. That’s not bad though because both usually cost around 100 Dollars more. But still, don’t get fooled by benchmarks alone. The performance of the Hi9 Plus is good enough for most things. You can surf the Web in Chrome, watch YouTube and edit photos in Adobe Lightroom without any big issues. I think it would have been better for Chuwi to choose a lower-resolution screen though. Because sometimes the UI can seem a bit laggy. But you probably won’t notice that unless you’re very picky. The gaming performance is good enough too but it certainly is not a perfect gaming tablet. Games like Asphalt 8 and Modern Combat 5 run fine. And I played Into The Dead 2 at medium graphics too. The same goes for PUBG Mobile. If you set the graphics to balanced it is playable. But you will see some stuttering in-between no matter how you set the graphics. Chuwi is shipping the Hi9 Plus with Android 8.0 Oreo. That is great because the similar Teclast T20 is running Android 7. Usually, tablets in this price range don’t get updated at all. In a Facebook post, Chuwi promised to release an update to Android 9.0 Pie this year for their Helio X27 tablets though. The Hi9 Plus is one of them. I don’t know if Chuwi will keep that promise. With that being said, they did release an update while I’ve been reviewing this tablet. So, they actually do continue to improve their software. That certainly is a good sign. As I said, it is running Android 8.0 Oreo right now. And I think it is great that Chuwi did not pre-install a heavy UI. In fact, it is pretty much vanilla Android. There are some Google apps pre-installed, as well as a file manager and an FM radio. And there are a phone and text messaging app. As I said, you can make phone calls an receive SMS with this tablet. Well, since Chuwi is not using a heavy UI, I don’t have much to say about the software. Again, it is pretty much vanilla Android and that is great. By the way, like most Chinese tablets, the Chuwi Hi9 Plus does not support Netflix in HD. You can watch Netflix, but not in HD. In my standard battery test, the Chuwi Hi9 Plus got a runtime of 8.5 hours. For this test, I’m always looping the same HD video at medium brightness. Sadly, those 8.5 hours are very weak. In reality, you probably won’t get an active use time of over 6 hours most of the time. That obviously depends on what exactly you are doing. It is also disappointing that the tablet loses quite a bit of energy while being in standby. If you turn off the screen when the battery shows 100%, it will be empty after about three days without actively using it. Alright, that’s my Chuwi Hi9 Plus review. Can I recommend it? Considering its price, the build quality and especially the screen are very good. I also like that we get almost vanilla Android and integrated LTE with a dual SIM slot. While the performance could be better, it is fine for its price. However, the speakers and battery life are pretty bad. Those are typical weaknesses of a lot of China tablets. The main highlights of the Hi9 Plus are the optional pen and keyboard. Both do work but both are not perfect. I can recommend the pen as a mouse or to play around only. The keyboard is totally fine to get some work done, but the Cover part of it could be better. Inexpensive tablets like the Chuwi Hi9 Plus certainly have its place. Usually, you can not get an Android tablet with a great screen, stylus, and keyboard cover for under 300 US Dollars. Most of the time you have to pay at least 100 Dollars more. So, I can recommend the Chuwi Hi9 Plus if you don’t want to spend a lot of money but want a high-resolution screen, integrated LTE, almost pure Android, and an optional keyboard. However, you should keep a couple of alternatives in mind too. A direct competitor is the Teclast T20. It is inexpensive too, has very similar hardware, but also a fingerprint scanner. You can’t get it with a pen or keyboard though. And it is running Android 7. But the interface seemed a bit snappier. If you are looking for an 8-inch tablet, you should check out the Chuwi Hi9 Pro. I really liked that one and it even is a lot cheaper. The hardware is very similar but you can’t get it with those accessories. An interesting alternative from a more famous brand is the Huawei MediaPad M5 Lite 10. While it has a full HD screen only, it offers four good speakers, a longer battery life, and an optional and better stylus. Depending on where you live, prices might be similar. Chuwi Hi9 Plus Review:The Chuwi Hi9 Plus offers a great display and a good build quality, especially when you consider how affordable it is. Other aspects like performance and software are pretty good too. Sadly, its speakers and battery life are weak. And while the pen and keyboard work, they're far from perfect. When you make phone calls are they via app or through your carriers phone number. Will this work on tmobile? Hi, i need to buy a 2 in 1 tablet for working online via video calls, creating documents and working on a blog. Recreational use, such as watching videos, streaming, gaming is not a priority however I would still like to have an optimal experience. Between a Chuwi hi9 plus and Teclast T20, which would you suggest will best suit my needs? Or, if you have another mid range reasonably priced tablet suggestion please share.